Of course we are recruiting, need more to consistently hold WG from the horde. Also remember that in Cataclysm, Tol Barad will be a more important combat zone than WG, and we will obviously place our HQ there. Rules here, for invite catch Gevlon on Maghteridon-EU ally side. Note to guildmembers: The report is crucial to our project. Unless we can document our progress, we cannot claim that we are reaching to our goal: denying the horde an important part of the content, making impact. Also we won't get new members if we can't prove we are serious. So please, if you participate in a battle create a "guild announcement" in the calendar with the outcome of the battle. I can't be online 24/7, don't expect me to do this job all the time! I saw an earlier post where it was suggested that a good place to gank and deny the Horde is the entrance to ICC. Have you considered getting everyone phased to the same level and doing this? Or, would it be impossible to deny them entrance enough to make it worthwhile? I can't think of a greater way to generate M & S anger than to deny them their ICC rep runs for gear and badges! I don't know who wrote the scalps addon... but maybe the same person would be willing to create an adjusted version of the WinterTime addon, which in addition to the existing statistics, also logs the date/time for each played battle, and keeps the data in sync with other players using the addon. 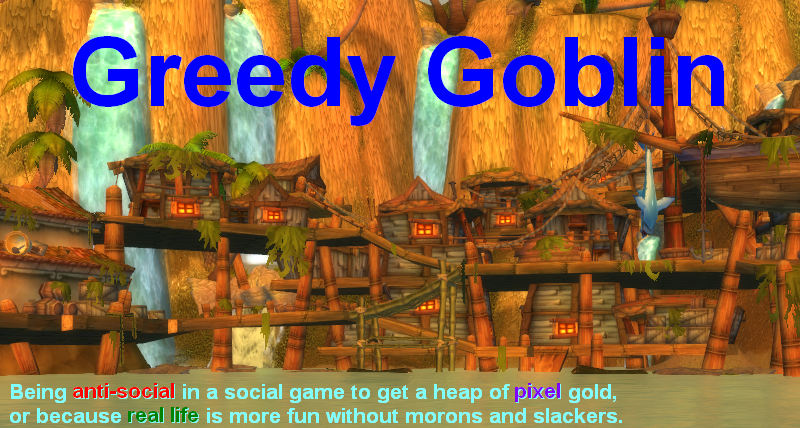 If everyone in the guild would install it, we should get ourselves a decent amount of statistics. I wonder why "18:50 Skipped due to raid" is not red. obviously it was lost and it's your fault as a PvP guild doing PvE content at this time. Gevlon, I got a question. Do you have US players who bought a EU account to play in your guild? If yes, does their connection is good? Because I would buy a EU account to play in ganking guild, but I don't know if the ocean in between would affect the connection speed. @Anonymous: You can't really deny ICC entrance because they can just fly inside it. @Wildhorn: yes we have. Create a TRIAL account and start a char. You'll see the lag. If it's OK, just upgrade the account and ask for invite. It's interesting, because we (Saurfang, Oceanic) are one of the few servers to have an Alliance dominated Wintegrasp. During evenings, it's fairly balanced, but even at 2am in the morning (server time), you'll find over a full raid of Alliance forces in the vicinity, culminating in the grand battle royale at BT as we push the Horde off the map. The last battle I enjoyed had us moving to graveyard camp the Horde with 20/24 vehicles, but we ran out of time. If a faction is motivated enough to learn strategy, it all just happens. It took quite a few months to bring all the WG participants on-side with tactics, but once they get it, WG defense is a piece of cake, played properly. I have 2 US accounts, and I created a trial account on Mag, rolled a lvl 1 rogue and within 10 minutes I was kicked off the server and the trial account permanently closed for what Blizzard said was "involvement in online trading activities." I spoke to no one in chat and was contacted by no one, and was killing level 1 wolves to check the latency. @ wildhorn, on my EU trial account my latency was high yellow to red, even in deserted Ironforge. Didnt seem feasible to pursue involvement. Im in US, west coast. In past people have suggested parallel US effort on Cho'gall, but I havent heard any updates. @grayhammer: I made a trial and so far the ping s rather good. It is in green turning around 200ms. So Gevlon, could you add Kebec to your friend list so I could contact you? I will use my 10 day trial than upgrade to full game.